One of the factors that have managed to push Apple to the place it occupies right now on the CE market in general and that of portable entertainment products in particular is the huge success that its iPod player has recorded over the years, the various incarnations of this product becoming somewhat of an icon of portable music for the entire world. Given this situation, it was to be expected for other big names in the industry to come up with an assortment of peripherals and devices to accompany the iPod and enhance some of its various functions, the most common type of such third-party accessories being represented by either earphones or speaker systems. And a set of speakers is exactly the product we'll talk about as follows, namely the inMotion iM7 BLK from Altec Lansing, which was actually a very pleasant surprise, due to the high quality of the sound it generates, its looks, and some of its other features on the side. The inMotion iM7 and its all-black version, the iM7 BLK, are not exactly new products, since they've been around for quite some time now. However, they manage to provide some features a lot of users will certainly find interesting, whether we're talking about the design, the level of mobility they provide, or, last, but certainly not least, they are now quite affordable, compared with some of the newer models to arrive on the market. We won't go into specific details regarding the design, the power or the level of versatility Altec Lansing's iPod-dedicated speaker can provide, because we'll detail each of these issues in the forthcoming chapters. We'll just say that this thing should really appeal to anyone, especially if we're talking about iPod owners who can't afford one high-end, latest-gen speaker system, at the same time looking for clear and powerful sound, good bass and a high level of portability. Without a doubt, Altec Lansing's iM7-BLK speaker system is one attractive product, starting from the form factor itself and ending with the quality of the finishing. 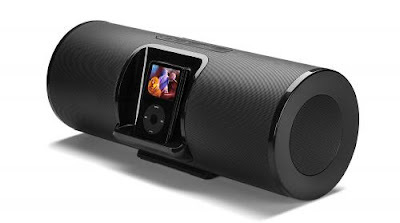 Hence, the speaker system has a very rounded shape, looking like one large tube equipped with an iPod universal connector and a couple of control options right in the middle. However, this unusual rounded shape is a lot more attractive than the “squarer” form factors displayed by most other similar devices. Color-wise, as you've guessed right from the name itself, the iM7-BLK is an all-black device, which, grants it certain elegance (further enhanced by the form factor). Pretty much every component of the speaker system is painted in black, the only exception being the Composite interface on the back and the white writing on the front (including here the lines that point out the position of the control buttons). The quality of the plastic is also very impressive, the device feeling great to the touch and looking even better, especially when in the right lighting. To make a long story short, this thing looks a lot better than we would expect, given the price point. Theoretically, the iM7-BLK from Altec Lansing is a portable system, but the truth of the matter is that a lot of users might have some problems carrying this thing around. And that's because the gadget measures a good 16.75 inches (42.5 cm) in length and about 6.5 inches (16.5 cm) in diameter, at a weight of around 10 pounds (4.53 kilos) with no batteries installed. In other words, it's a pretty big thing, which will certainly occupy a fairly large amount of space anywhere you might place it, and it's not really ideal for taking along when going on a trip where luggage space is limited. It's quite interesting to note that the designers and engineers from Altec Lansing have placed a fairly small amount of buttons on the speaker system itself, leaving most of the control options for the remote control. So, practically, the only buttons we can encounter on the top side of the iM7-BLK are the power switch and the volume adjustment buttons, the latter providing a fairly good level of sensitivity when pressed. In the immediate vicinity of the power switch, there's also a blue activity LED, which informs the user whether the device is powered or not. One relatively bothering thing was the fact that you can't really “feel” or “hear” the subtle differences of adjusting the volume, since there are no “clicking” sounds. Guess that you'll just have to keep pressing the buttons until the audio level reaches a comfortable level, since there are no visual indicators of the values you're adjusting. The device sports two “slots,” if we can call them that, which have the purpose of housing the 8 D-size batteries used for powering the iM7-BLK when not connected to the mains. Both slots are placed on the rear side, on the left and right extremities, respectively. As expected, the most important interface of the iM7-BLK is represented by the iPod universal connector, which is placed right on the front side, in the center of the speaker system. However, the gadget from Altec Lansing delivers other connectivity options, all of which are placed on the rear side, underneath the rubber grip used for carrying the speaker system around. So, users can also make good us of the Composite and S-Video interfaces in order to hook up the system to a TV set, while the Line-in audio interface is very useful for connecting an audio player/MP3 player/PMP to the system (other than the iPod, of course). As mentioned above, the remote control offers a lot more options than the main body of the speaker system. So, besides a secondary set of Power and Volume controls, the remote can control the specific amounts of Bass and Treble the speaker system outputs, as well as certain playback options, including Play/Pause, Fast Forward and Rewind. Unfortunately, the remote has two major flaws. First of all, despite being quite slim and thin, it's also rather ugly, not really fitting the attractive external design of the iM7-BLK. Second, its functioning range is absolutely appalling, namely just around 10 feet (or 3 meters), which is far from being of any use, especially if you've installed the audio system in a larger room. One of the cheapest touchscreen phones on the market, the new LG KP501, also known as Cookie, should not be considered a low-budget one. Slim and lightweight, the handheld uses the same proprietary LG flash UI, which has been improved lately. The affordable touchscreen phone was introduced by Orange into its network distribution line thanks to the huge success that the previously black Cookie (LG KP500) had since its launch in November 2008. Simple and elegant, LG KP501 promises great value for money, but also more colors available for customers. Following the overwhelming market success of LG KP500, dubbed Cookie, LG decided to launch a sequel in partnership with Orange. 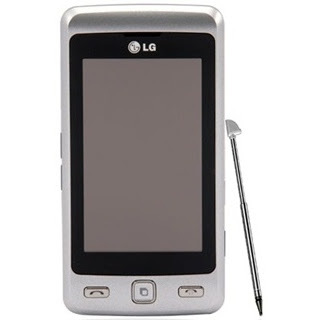 Announced in January 2009, the new LG 501 Cookie was made available the next month, in February, and can be acquired for around 150 USD, free of plan, but can also go as low as 20 USD with a 24-month contract with Orange. The phone is available in a wide range of colors: Anodizing Silver, Capri Green, Pink and Black. One of the simplest phones I have ever seen, LG KP501 is no different in design compared to its KP500 Cookie predecessor. In fact, I only noticed a minor difference between the two, regarding the two buttons on the front, which are bigger for the KP500 model. Sleeker and lighter than any other touchscreen phones on the market, KP501 Cookie seems to be the peek of ergonomic design coming from the Korean company. The candybar measures 106.5 x 55.4 x 11.9mm and weighs exactly 89g (including battery). It features a nice polished plastic that makes it look rich and attractive, especially if you own the silver or black version. The front part of the phone is almost entirely seized by the huge 3-inch touchscreen. Below the display, there are three buttons: Accept calls, Reject calls and Shortcut key (middle). The first two are metallic, which should prevent the paint from wearing off. The in-call speaker is hard to be noticed just above the screen. The right side of the phone features a dedicated camera button, a lock/unlock key and a microSD card slot. The left side of the device includes a dual volume key and the proprietary LG port, where one can insert a charger, a Stereo headset or a USB cable. The stylus has been moved from its usual position, on the bottom right corner of the phone and can now be pulled out from horizontal. On the back of the phone, LG included a simple 3.2-megapixel camera, which lacks flash and is not protected by a lens cover. Stylish and pocket-friendly, this phone seems to have something for everyone. This handset also fits trendy people. The LG KP501 Cookie is not look like any other typical LG phone but it does have one LG quality - the superior finish. The form of the gadget is incredibly sleek. Furthermore, LG KP501 Cookie resembles the Prada fashion phone, but this time, the design has been greatly improved to make it look much smarter. This handheld can be best labeled as an "entertainment phone" but it can also be a great asset for business persons too, as the email facilities and the on-screen QWERTY keyboard are commendable. In my opinion, LG KP501 Cookie is one of the best good-looking touchscreen phones that are now available on the market. Add to that the excellent ergonomics and you might have another huge market success handset. One of the main drawbacks of the candybar is the 3-inch TFT resistive touchscreen display that supports 262K colors and QVGA 240 x 400 pixel resolution. It's very clear that LG doesn't have the technology needed to develop a touchscreen that could be eligible for use outdoors, in strong light. In fact, if you plan to use it in sunlight, don't expect to see anything on the screen. You can barely distinguish anything on the screen, and what you can see are not phone numbers, which are the hardest to notice. This is pretty much the same problem that almost all LG handsets suffer from. The sales package contains a protective foil, which prevents the touchscreen from getting soft scratches. We still get some nice features for the screen, such as: accelerometer for auto-rotate, handwriting recognition and haptic feedback. The 3.2-megapixel camera doesn't feature any flash capabilities, auto-focus or any other complex features like geotagging or ISO. I was surprised to find a good camera on such a low-priced phone, but LG preferred to include a 3.2-megapixel camera, without adding any advanced capabilities. Thus, you won't find the Schneider-Kreuznach optics, flash or auto-focus capabilities. Still, if you check the samples below, you'll notice that pictures taken with Cookie have little to no noise. Even though pictures are a little bit low on details, this is barely visible unless you zoom in the images. The intuitive user interface of the camera doesn't have any new option compared with its predecessors. Users can take pictures with a maximum resolution of 2048x1536 pixels. Clips can be recorded in QVGA resolution (320x240 pixels) at 12fps. Thanks to the dedicated camera button, taking pictures is a smooth experience. LG KP501 Cookie features an improved version of the highly acclaimed Flash UI and can be controlled only with the finger. The first thing I noticed is the fact that it's not fully customizable anymore, like Prada. Moreover, the UI has been mixed with Orange's functions, so you will have specific menus that have been completely introduced only for this handset. The number of animations has been kept at a high level. While the layout of the menus has not changed at all, there are some tweaks that improve the usability. Besides the fact that you get more options for everything (like widgets), you have now two Home screens available that can be accessed by simply sweeping your finger to the left or right when in Home screen mode. The phone also features a Document viewer application, which supports Word documents, Excel files and PDF files. There's still no YouTube client, but I did not expect that anyway. You will still be able to get to the mobile web version and watch clips. The phonebook of the device looks standard and accepts 1000 contacts. You will be able to separately see contacts stored on the device's memory and the SIM ones, according to the choice you make. The Main menu has been organized into four parts accessible from the tabs placed on the right side of the screen. The first one on the top will give you access to the phone and messaging functions, while the second represents the multimedia and entertainment area included in the handset’s firmware. Productivity tools (Calendar, Calculator, Unit converter, Organizer, Drawing Panel) are available by tapping the third tab. For Settings, check the last tab. I noticed a slight improvement in terms of speed when browsing the phone's menus. This is great news indeed and it's probably due to the improved ARM processor that has been included. The Java emulator 2.0 MIDP works with all Java-compatible software, but has a file size limit that cannot be exceeded. LG KP501 supports the GPRS and EDGE connectivity, both class 10, but no UMTS/HSDPA technology or Wi-Fi. Data transfer speeds are average, but the integrated browser and the large screen definitely enhance the browsing experience. Tested on the EDGE, the phone definitely underperformed, as you can see from the screenshots. Other connectivity tools include the Bluetooth 2.1 with A2DP support and the USB 2.0 for PC synchronization (with charging). When connecting the USB cable, you'll be able to choose from five modes: PC Internet, Mass storage, PC Suite, Music sync and iSync. All of them are intuitive and easy to use, so there's nothing more to add here. In terms of messaging, the slider is compatible with a wide range of type messages: SMS (300), MMS, EMS, email (no SSL support), and Bluetooth 2.1 with A2DP. Moreover, thanks to the on-screen QWERTY keypad, you'll have no problems typing fast. The quadband (GSM 850 / GSM 900 / GSM 1800 / GSM 1900) network-compatible slider has a good GSM signal reception. The in-call sound quality is very good, but it seems that this has become common for the latest LG mobile phones. LG KP501 Cookie features a medium power ARM9 family processor, which runs at speeds of up to 201 Mhz. This could have been better, especially since LG has included an improved Flash UI that asks for a better CPU than those usually embedded in mid-budget handsets. Nevertheless, I haven't noticed important lags when browsing the menus. In fact, I was surprised by the fact that Cookie seems to be snappier than other high-end LG phones, such as LG Renoir or Prada 2. The handheld comes with 48 MB of internal memory, which can be upgraded through the microSD slot card up to 16GB. We tested it with an 8GB microSD card and everything worked smoothly. The memory is hot-swappable. LG KP501 Cookie features exactly the same music player that Prada 2 fashion phone has also embedded. Users will be able to filter their music by artist, album, and genre, or make their own playlists. The music player now features an Equalizer setting with five predefined modes, but no possibility for customization. The sound is good, but could be much better if a 3.5mm had been included in the handset, so users can attach better headphones. The FM Radio features RDS, can only store up to 50 base stations and can be played through the loudspeaker. Both radio and music player can be run in the background and accessed on the Home screen through their correspondent widgets. LG KP501 Cookie features a 950 mAh Li-Ion battery, which depletes very fast if you set your screen brightness to 100%. The official numbers stated by LG – 350 hours in standby mode and three hours and a half of talking – are low, as it stands to reason. Fortunately, with some tweaks, such as setting brightness screen to 40% and locking screen to 10 seconds, we managed to obtain around four days of use, with two hours of talking. It’s more than acceptable if we think that we're talking about an LG phone, which doesn't excel when it comes to battery. Officially one of the cheapest touchscreen phones on the market, LG KP501 Cookie is an amazing device for those trendsetters. Even though it hasn't been tagged as fashion phone and can successfully serve businessmen, the sleek device is meant to greatly appeal the masses with its look and price. Thanks to the Orange distribution, the phone will probably become a hit in sales for the Korean company. The most attractive features of the phone are definitely the cheap price and the exceptional look and finishes. These seem to be the most important features that a buyer is looking for when acquiring a phone. I would like to enlist here the improvement regarding the Flash UI, which is much snappier than previous phones that included this kind of interface. Camera and battery are also nice additions to the great looking phone. I guess the most important drawback of the phone is the fact that it cannot be used outdoors in sunlight. Also, browsing the Internet is a nightmare, as the EDGE data transfer performs poorly. I think that a more generous sales package would've been nice, as it doesn't even include a USB cable. 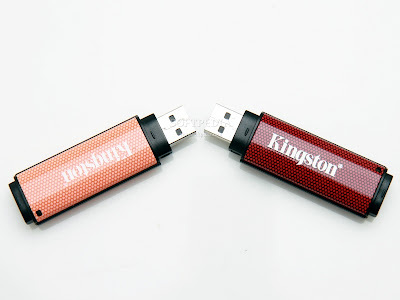 As you probably already know, Kingston Technology is one of the leading makers of memory products in the world, ranging from system-specific memory to flash and solid state drives. The DataTraveler USB Flash Drive series is one of its most important products, being praised by users around the world for its high speeds and reliability. Well, we recently had the chance to put two of the latest DataTraveler models under our microscope: the 64GB DataTraveler 150 and its smaller in storage size brother, the 32GB DataTraveler 150. Having made its appearance in November 2008, the DataTraveler 150 series quickly became a user's favorite portable storage choice thanks to its great price and above average quality that basically brought an elite high speed, high capacity flash drive to a public that could not afford one up until the DataTraveler's release. Although we are not strangers to the DataTraveler series USB flash drives, our professional meeting with the two devices did reveal pretty interesting facts that an eventual buyer will want to take into account when choosing one of the two. But we'll be tackling those parts in the next pages of the review. Whereas testing is concerned, we tried to do professional testing, as well as the usual stress-testing a normal user would normally submit his/her flash drive to. The results were quite unexpected in that both the 32 and 64GB DataTraveler 150 versions exceeded our hopes in a lot of areas. These devices have clearly been made to be used in a lot of different environments and by different types of people. How they fare after extreme wear and tear from a user that wants to squeeze as much as he/she can from his/her Flash Drive? Extremely well, as you will see but not without some glitches.